Sure you could make pie, you could even make a pie with a crumble top, but why go to the bother when what you really want is the taste of these two classic early summer fruits, cooked with some sugar and topped with some whipped cream. The crumble gives you the buttery, slightly salty crunch you need to off set the juicy cooked fruit. Clean, stem and cut up 4 cups of strawberries 2 cups of rhubarb, add 1/4 cup of organic Corn Starch (for thickening, in this instance because both strawberries and rhubarb are so lacking in pectin and juicy they need a little more than usual) and 1 cup of sugar. Toss the fruit with the flour and sugar and place in a baking dish (9 x 12 or some pan that is close to this I often use Spanish Clay baking dish that is 8 x 13). In a large bowl add: 12 Tablespoons of unsalted butter, 1/2 teaspoon of salt, 1 cup ground pecans (or any other nuts you have on hand) 1 cup flour, 4 Tablespoons brown sugar, 2 tablespoons white sugar and 1/2 teaspoon cinnamon. Mix with your hands until everything is buttery and well incorporated then spread over prepared fruit. Please adopt it as you see fit, in this version above I added about a 1/2 cup of rolled oats and reduced the flour to a 1/2 cup. Bake for about 45 minutes. 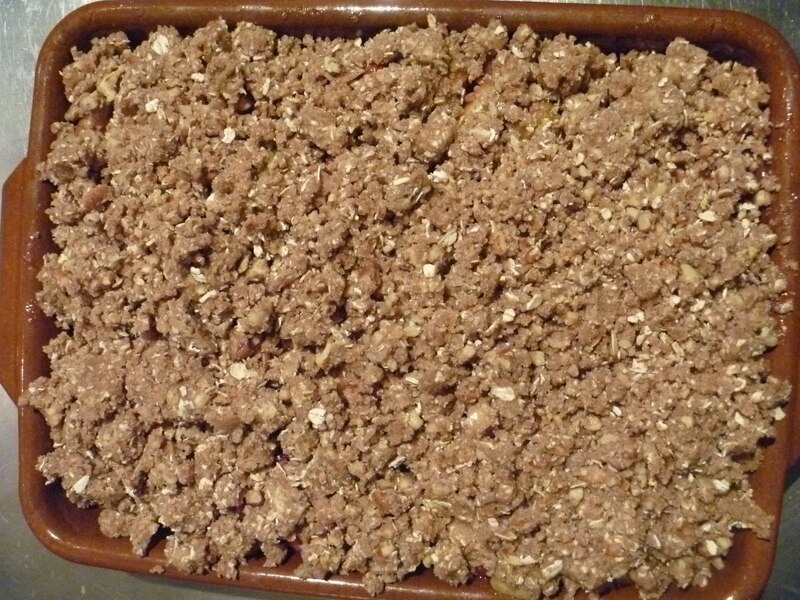 It is done when the top is nicely browned and the fruit is bubbling around the edges. Serve with unsweetened whipped cream or vanilla ice cream. 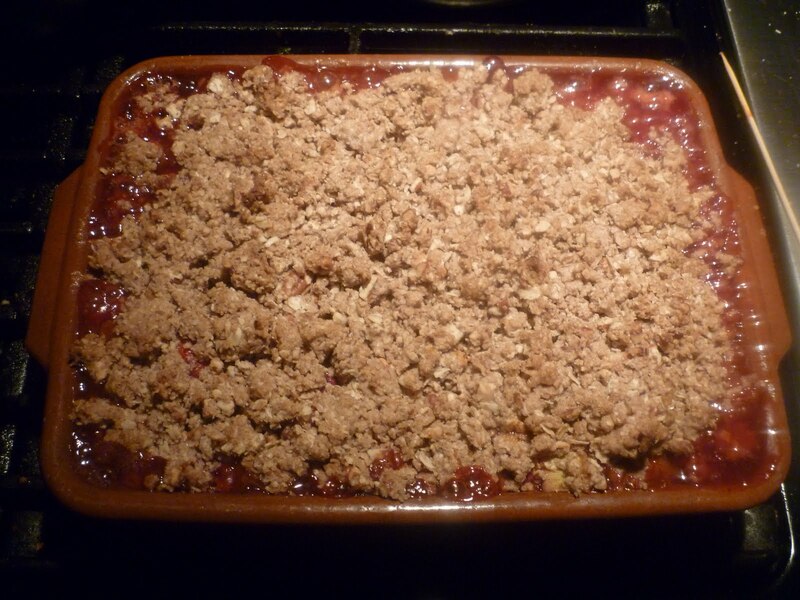 This entry was posted in Recipes and tagged crumble, rhubarb, Strawberry, Strawberry Rhubarb Crumble. Bookmark the permalink.